Mindfulness-based interventions have been shown to have benefits across a diverse range of physical and mental health problems. The present qualitative study explores the experience of individuals diagnosed with a terminal cancer who attended either of two six-week mindfulness groups. Five people participated. There was a rich diversity in participants’ responses. Participants reported finding mindfulness practice beneficial in a range of ways, as well as valuing the social context of the group and the wider hospice setting. Participants also described forming a meta-understanding of mindfulness practice, which was informed by the experience of others in the group as well as their own, and this understanding illuminated the degree to which people found mindfulness beneficial. 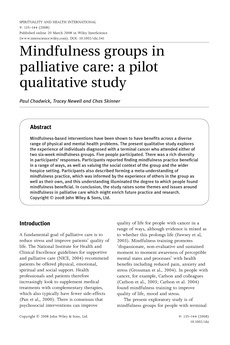 In conclusion, the study raises some themes and issues around mindfulness in palliative care which might enrich future practice and research.